Uncovering the mysteries of musical instrument-making, identifying the rare essences of their woods, reconstituting the alchemy of their varnishes, the originality of their shapes or the delicate balance of their volumes are all part of the exciting missions and field of competence of the Centre of Arab and Mediterranean Music’s Musical instrument making workshop. This workshop is primarily a study and research unit on organology and the making of traditional musical instruments. It is also a structure within which knowledge is applied, with programmes including practical interventions (maintenance, restoration, instrument-making). The work undertaken by the workshop conforms to an experimental and pedagogical approach. Besides its mission to save and rehabilitate ancient techniques, the workshop seeks to promote activities with, for example, the organisation of exhibitions or a competition of traditional Arab instrument-making. Ultimately, the Musical instrument making workshop seeks to constitute a computerized database containing all the technical and historical information pertaining to instrument making for Arab music. The workshop is established within the Centre for Arab and Mediterranean music and is a unit belonging to the Activities and Programming Department. It is closely connected to the Museum Department and to the Studies and Research Department for the design and implementation of programmes concerned both with pedagogy and the instrument-making profession (publication of instrument methods, promotion of the instrument-making profession). - making of existing musical instruments or of those about to disappear following a scientific methodology based on the collection of any accurate data concerning measurements, raw materials and assembly techniques of these instruments. - Restoration, if need be, of musical instruments belonging to the Centre of Arab and Mediterranean Music. The workshop has also established a dialogue with instrument making professionals in order to participate in examining the problems of the craft. 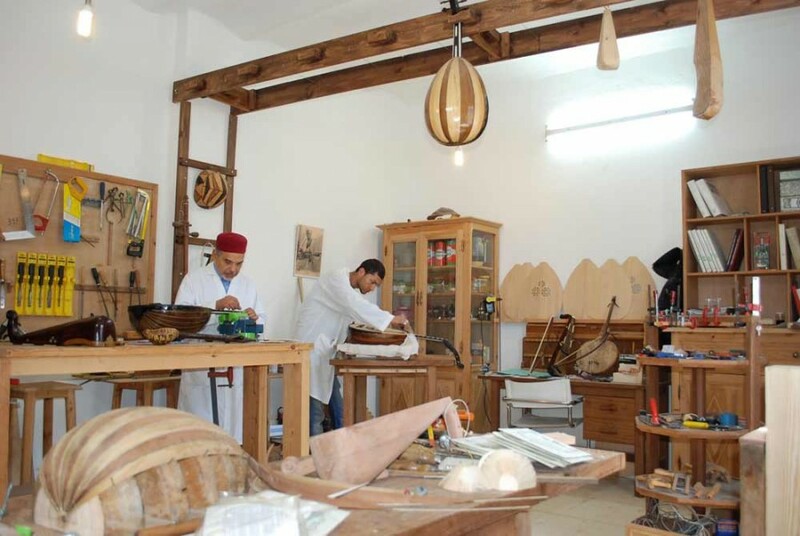 Amongst the achievements of the instrument making workshop is an exhibition on oud and violin-making, making a lute based on a tenth century Arab manuscript, the organisation of a competition to make a Tunisian lute and the establishment of a ney making workshop.